So many of my friends on Facebook are jumping into the National Poetry Writing Month that I’m feeling the peer pressure! I’ll do a make-up poem this afternoon, since I missed the monthly opener, yesterday! This entry was posted in Just Life, Poetry and tagged love, NaPoWriMo, National Poetry Writing Month, poem. Just some quick backstory… my dog ate my notebook. Yes, he ate the notebook in which I write my poems! But undaunted, I strode manfully to the mall and bought a new notebook. That notebook is the subject of a little poem I write tonight. 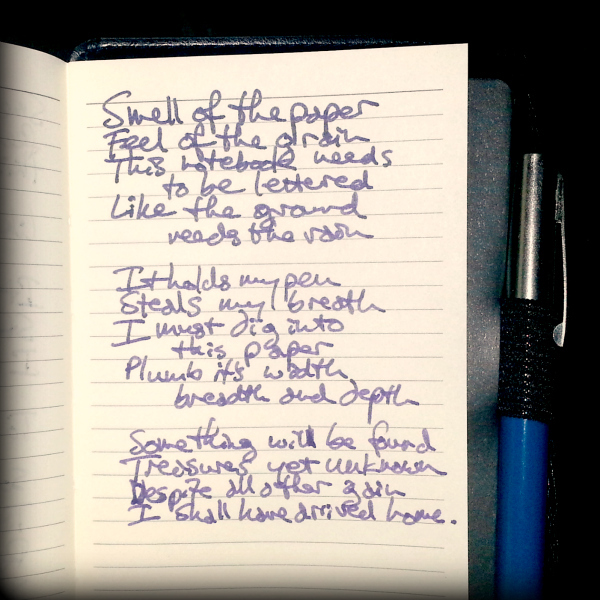 This entry was posted in Just Life, Poetry, Writing and tagged anticipation, dog ate my homework, notebook, poem. This often happens when I sit to intentionally write some poetry. A still, quiet moment allows me to hear some of my more painful inner movements that are drowned out in the usual activity of the day. It’s not that I’m totally filled with melancholy, but it’s there. In recent months I’ve been in several different situations discussing the impact of depression on our lives and those conversations have had me thinking. I have lived with the ebb and flow of depression as long as I can remember. I don’t think it’s ever outright owned me, but it’s been there. I’ve learned to watch the seasons and to be aware of their impact on my moods. I’ve learned to listen to the people who love me and live with me; Teresa will let me know when I seem to be letting it get an upper hand. I’ve been thinking about some of the ways that being a person of faith has impacted the way I deal with my depression and darker moods. I think that growing up with a “seen and unseen” worldview has been helpful for me. I was raised to put my faith in something beyond my senses, beyond my ability to perceive, as I could perceive other things. So when the dark thoughts come and I perceive no hope, I have this reflex to look past it and try to see what may not be seen. I have a cognitive trigger built into me that causes me to seek. When I seek I am in movement. When I am in movement I cannot be held in the grip of anxiety, fear or hopelessness for too long. So when I am in the grip of depression, it never holds all of me, there is a bit of me still free to roam. I’m not saying that this idea is a panacea or a magic cure all of some kind. And there will always be times when our imbalanced physiology demands the help of trained professionals, both for counseling and for medication. When I stop seeking, then I think it will be time for me to see a professional. But having that safety valve built into me allows me to be very open about the presence of darkness in my soul. I can deal with the fact that even as a creature of the light, I retain these shadows; I own the shadows. But the shadows don’t own me. I’m grateful to God for this. And so even as I write something that questions what “inside me grows” I am also very assured that it will not one day rule me and destroy me, or supplant in me what God would do. My unease is sacred. 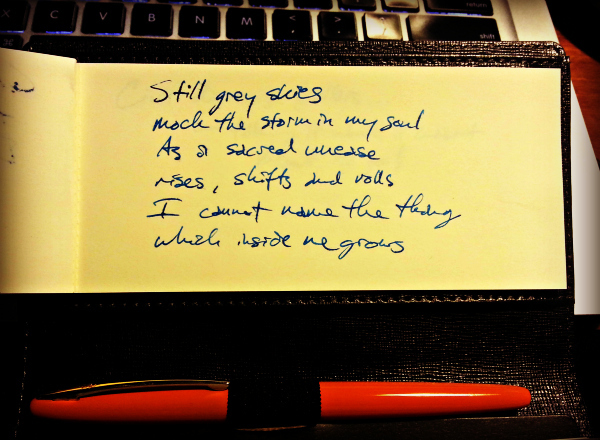 This entry was posted in Just Life, Poetry, Writing and tagged depression, faith, hope, life, poem, poetry, seasons, seeking.